Here are your fantasy and sci-fi highlights from today’s Golden Globes nomination announcements. I think the announcers were thrilled to be there. America Ferrera is THRILLED. Feel free to add your own thought bubbles to these thrilled announcers’ flattering photo in the comments. 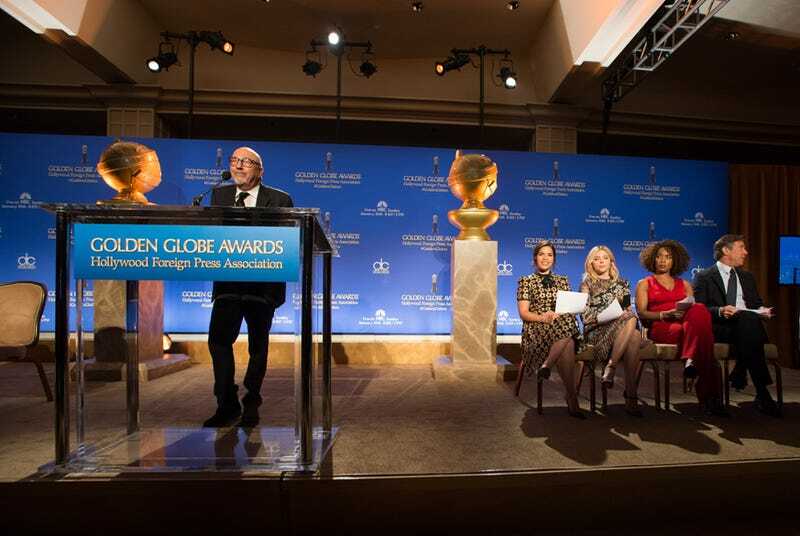 Where the Emmys were more mainstream, it seems like the Globes are a bit more niche, although both are indicative of the trend towards cable and streaming shows. (Hulu got a nom!) When the Emmy nominations were announced, I admitted to some conflicting feelings because they recognized Tatiana Maslany for Orphan Black, but not anyone for Outlander (except Bear McCreary). Now it’s the opposite! So my conflicted feelings remain. How about you? Here are the TV highlights. Eva Green - Best Actress - I know folks here will be happy about this one! In TV, Netflix leads with 8 nominations, followed by HBO, Starz, Amazon Video, and FX (7, 6, 5, 5 noms respectively). Then we get to the first major TV network, ABC, with 4 nominations. The top five most nominated TV series each have 3 nominations - American Crime, Fargo, Mr. Robot, Outlander, and Transparent. Pixar doubled down on Inside Out and The Good Dinosaur for Best Motion Picture [Animated]. Will it split the vote and hand the victory to The Peanuts Movie? I just found out that Ennio Morricone did the score for The Hateful Eight, because he’s nominated for it. If I didn’t want to see it before, that alone would have sold it. In movies, Twentieth Century Fox leads with 12 nominations, followed by Universal Pictures and The Weinstein Company, each with 8 nods. The top five most nominated movies are Carol (5 nods), The Big Short (4), The Revenant (4), Steve Jobs (4), and The Danish Girl (3). TV seems to be the place for quality fantasy and sci-fi this year, if random award nomination lists are to be believed. What do you think? Are you cheering for your favorite show? Are you angrily tweeting about an outrageous snub? Vent your feelings here!